Install HIGHWIRE Powerstar Base 8 in airports, stations, shopping centres, retail outlets, hospitals, prisons, sports centres or anywhere that has legacy coax cable and analogue cameras that you want to upgrade to IP Video cameras. Four 8-channel Base units provide 32 IP channels in 1U, with space for an optional IU power supply and up to 25W POE per channel. The HIGHWIRE Powerstar product family offers high-speed Ethernet, reliable power delivery and long range even over low-grade coaxial cable. HIGHWIRE Powerstar is now available in an integrated 8-channel modular unit for rack mounting, giving up to 32 channels in 1U. Veracity’s HIGHWIRE technology has been proven in tens of thousands of installations over many years, delivering high-reliability full 100Base-TX Ethernet in all conditions. This offers consistent, predictable, IP video network performance even with today’s high resolution HD and 4K IP cameras, delivering a full speed over 300m of RG59 cable, and 500m over RG11. Base 8 integrates eight HIGHWIRE channels and a gigabit switch into a single unit. It is specifically designed to allow rack-mounting of up to four units in 1U, giving 32 channels per U. Veracity’s unique 57V rack-mounted POE power supply accessory can be mounted in the same 1U. 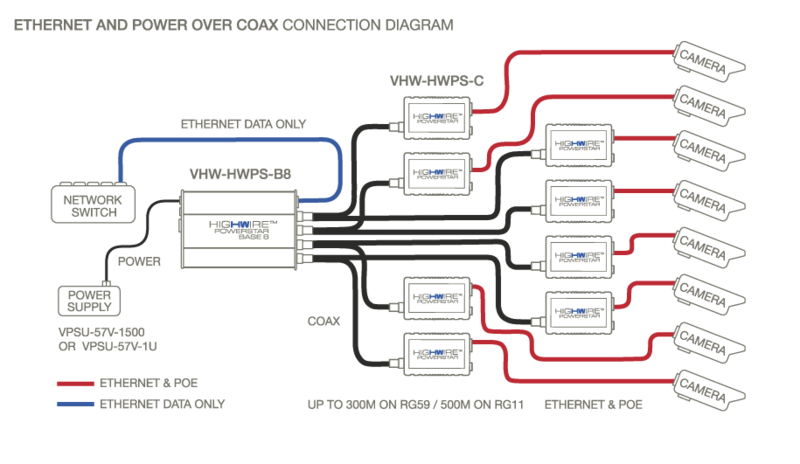 The integration of a Gigabit switch reduces the number of main switch ports required to connect many IP video cameras. Thus each HIGHWIRE Powerstar Base 8 unit requires only one main switch port, or 4 network ports for 32 channels. Each Base 8 unit also has a rear mounted SFP socket for an optional SFP fibre Ethernet module. In the diagram below, the HIGHWIRE Powerstar Base 8 unit is connected to 8 legacy coaxial cable links. At the camera ends, there are single-channel HIGHWIRE Powerstar Camera units connected to each link. The original analogue cameras are replaced by new IP cameras which are connected to HIGHWIRE Camera units. The Base 8 unit is powered by a Veracity 57V PSU and power is delivered up the coax to power the HIGHWIRE Camera units which, in turn, power the IP cameras. With no need to configure IP addresses, set DIP switches, or pair units, installing HIGHWIRE Powerstar is straightforward. As soon as power is applied, the IP cameras will power up and their IP addresses will become available on the network. The zero configuration HIGHWIRE units are completely network transparent. HIGHWIRE Powerstar Base 8 is compatible with Veracity’s Powerstar Duo and Quad Camera units, connecting multiple IP cameras over a single coax. For example, an obsolete analogue PTZ camera could be replaced by four low-cost static IP cameras using a Powerstar Quad unit. Veracity power supplies for POE are all 57V DC devices, to provide the maximum power and distance possible within the POE standard (802.3af and 802.3at). Our 1U rack-mounted 57V 8.8A power supply is specifically designed for Veracity’s IP Transmission products, including HIGHWIRE Base units. The Base 8 rack mount kit can be assembled together with the 1U PSU to provide a complete power-and-32-channel-EOC* solution in 1U. Veracity’s 1U POE power supplies are designed to allow redundant power configurations for maximum reliability. Pairs of units (in 2U) may be cross linked with an optional cable assembly to allow full power to be delivered to the Base units, even in the event of a failure of one of the power supplies. Powerstar Base units are available in 1, 4 and 8-channel models. Powerstar Camera units are available in 1, 2 and 4-channel models. Any Base model is compatible with any Camera model.